Content A collection of narrated videos and other essential documents about how to work with manufacturing in Pro/E . Windows Media player is required. 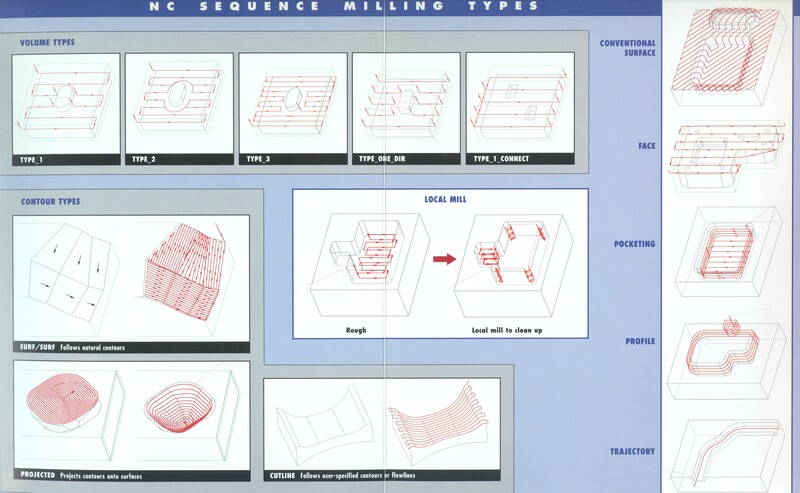 A chart with an overview of the most common types of milling in Pro/E. Adding a New Sequence 8 min. NC-Check of 2+ sequences 2 min. Adding a New Operation 3 min. Editing and Manipulating 8 min. Simulate already cut workpiece 3 min. Expert advise for use of Pro/NC 45 min. 5-axis control in Pro/NC 10 min. The 'Rod' Videostudy 22 min. Full two-sided machining, including Fixture setup and Material removal. HIGHLY recommended for students doing the Final Project in CAM. In text, videos and images, the way to think and work with you final project is explained. Quite a few very important milling parameters are described. Main focus is on how to create a cavity support for 'difficult-to-clamp' objects.